DMS Bai Yai Assamica Green Tea is a whole leaf green tea picked from north Thailand’s native tea trees. The large open-rolled leaf produces a clear and bright yellow-green liquor. The tea shows none to only moderate bittering, depending on infusion period and water temperature. In the region of Doi Mae Salong, center of tea cultivation in north Thailand, the native tea tree finds optimal conditions at altitudes of 1200 – 1600 meters. Since the late 1980’s, the ethnic Chinese and mountain tribes population have made tea the region’s major cash crop. 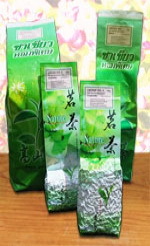 Our DMS Green Pearls is a green tea from Doi Mae Salong, north Thailand. Here, the actually Taiwanese ‘Cing Xin’ tea cultivar finds optimal conditions between 1200 and 1600 meters. The carefully handpicked leaf unfolds after about 30 seconds in hot water, before producing a clear, bright yellow-green cup. With appropriate water temperature (see below), pleasantly fresh, invigorating taste without any bitterness or astringency.